Quality Fence Pros is a fencing business that focuses on both repairing and building fences, but their website was thrown together, unlike their fences. They needed a website that emphasized their professionalism and quality of work. After getting to know each other, we went to work on their new website. We incorporated pictures from a photoshoot of their work and new content for SEO. During our one day build, we gave their website a logical flow that made it easier for customers to follow. We also created a new logo and picked out colors and fonts that aligned with their brand. 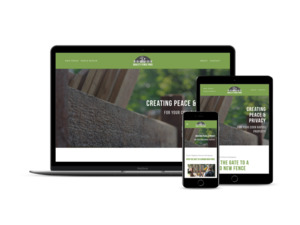 They were happy with their new mobile-friendly website that showed off their quality fences.